I don’t want to beat around the bush, My Time at Portia is one of the most ambitious indie titles I’ve played in a long while. There’s an absolutely phenomenal amount of things to do and Pathea Games has done a pretty good job ensuring players get a taste of everything. My Time at Portia is primarily a simulation RPG and follows a similar initial plot to many other titles in the same genre. The gist is that you’re new in town and have inherited some neglected property from your father. In order to fix the place up, you’ll not only need to make “Gols” (the local currency of Portia) but also gather materials, and get to know your new neighbours. Players are introduced to a number of money-making options right from the get-go. Primarily, you’ll take on commissions from the local Commerce Guild which invite you to craft items the local residents need. If there’s nothing on the noticeboard that takes your fancy, you could always sell your wares to the town’s abundance of vendors or complete side-missions for some additional cash. As with most things, crafting these goods requires materials, and you’ll need to venture into the various ruins around town to find the majority of them. I found myself spending a lot of time exploring these ruins. There’s just something inherently fun about jumping around the place with a pickaxe, jetpack, and some magic goggles! Besides looking fly, the goggles also highlight caches of goodies in the ruins, which may prove vital dependant on how you choose to play the game. Alongside fixing up your workshop, a narrative unfolds through a series of story missions. You’ll uncover more about the post-apocalyptic setting of My Time at Portia and in the process unlock new areas to explore. Some missions also bring about improvements to the town – such as adding “Dee-Dee Transport” stops at various points around the map, which makes getting around a lot quicker. While I appreciated the missions that offered a little variety, the storyline itself is fairly inconsequential. Personally, I think that’s just fine, as it’s not usually the storyline that attracts players to this kind of game. 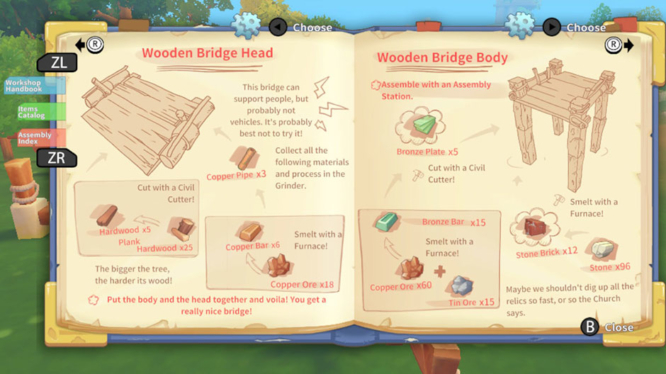 It’s the crafting, the mining, and the repetition while improving yourself and your workshop that usually appeals, and for the most part, My Time at Portia gets that spot on. I say “for the most part” because as it currently stands, My Time at Portia feels like it could do with a little more polish. This is first apparent once you get past the character creator at the beginning of the game. The initial cutscenes (and indeed all cutscenes in My Time at Portia) are unvoiced. Many games don’t feature voiceovers and this would usually be absolutely fine. However, to combat that, games like Animal Crossing and Stardew Valley make use of some kind of noise to signal when a character is talking. My Time at Portia on Nintendo Switch does neither. The lack of any kind of voices from characters was a little jarring. At one point, I looked away from the screen and didn’t notice the loading screen (that had been present for over 30 seconds) had finally gone away. These long loading times were something that plagued my playthrough of My Time at Portia on Switch, popping up every time I entered or exited a building. Familiarising yourself with a new town takes time, however, waltzing into the wrong place in My Time at Portia takes this to a whole new level of frustration. Pathea Games were quick to acknowledge that loading times were a problem and has already released a day-one patch in an attempt to improve the situation. Comparing the patched version of the game to the previous version (which I spent the most time with), it’s clear they were able to improve the load times considerably. Prior to the patch, I clocked times of upwards of 35 seconds when navigating between buildings and players can now expect times of around 10 seconds. It’s a massive improvement and makes My Time at Portia significantly more enjoyable to play. Loading times aside, I was relatively happy with the performance in docked and handheld. I did notice some slight pop-in (but nothing gratuitous) and at times it felt like animations were a little slow to kick in. On the whole, though, the frame rate felt solid with minimal drops. There were also a few times that I could kick an invisible tree or talk to someone who wasn’t actually there, but I expect to see these issues fixed in future patches. I don’t think I realised just how important a game’s soundtrack is to me until I played My Time at Portia. Frankly, you’re a better person than I am if you can get through more than three loops of the same elevator music that plays around town! I honestly couldn’t tell if they’d picked just one track per season or if it was a bug that caused the same tune to loop over and over and over and over and… I’m sure you get the picture. It was so grating to me that I ended up having to turn the music off entirely. This, however, revealed another issue with the game’s audio. Some basic sound effects, which I’d expect to be present in any game, were completely missing. Although My Time at Portia does have sound effects, there were some very odd omissions. Most noticeably, running around doesn’t playback the familiar sound of footsteps. There were also places (such as the fountain in the church) where sound effects didn’t kick in until I was very close to the object emitting them. Then, when walking away, they abruptly cut off rather than fading out into the background as you would expect. I can say with some confidence, that if you can get through the unrefined nature of the game and you’ve been longing for a new simulation RPG, you’ll have a good time with My Time at Portia. The sheer amount of content packed into the game is astounding, meaning that you really have the freedom to carve out your own story and plan out exactly what you want to achieve. Follow the main story-line and get a glimpse of everything the game offers if you’d like, or branch out and do your own thing. 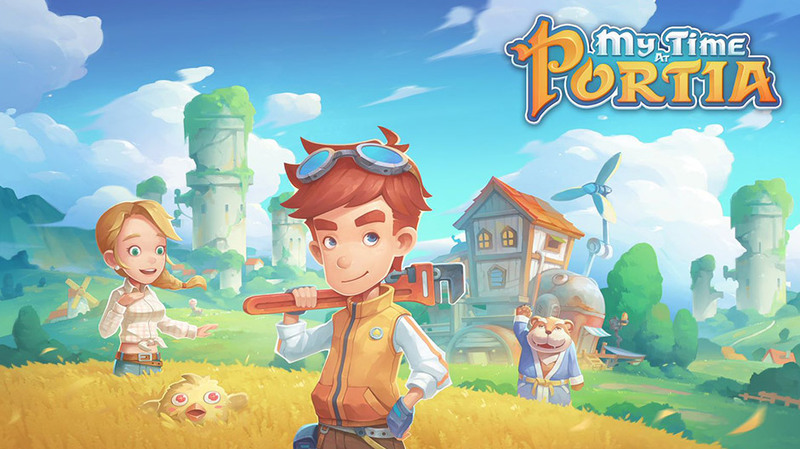 Be it mining, farming, dungeon crawling through the caves and ruins, crafting goods or getting to know the residents of Portia, if the game clicks with you as it did for me, I think you’ll be hooked for weeks (if not months). While you’ll need to do a little of everything at the beginning, as you get more cash you can cut some corners by visiting the various vendors around town. I also really like the ability to discover new blueprints early at the Research Center by exchanging data discs found in the ruins. Alternatively, trade these discs with the church and get some seeds for your farm. It’s another example of where the player is given multiple options and is free to choose their preferred route through the game. My Time at Portia certainly isn’t perfect but Pathea Games has already shown they’re committed to improving and expanding upon the game. In addition to the loading time patch, an update with additional story missions and side quests is also on the way. If the team can fix up some of the other glitches and throw in some HD Rumble support for good measure, I’ll be a very happy workshop owner indeed. 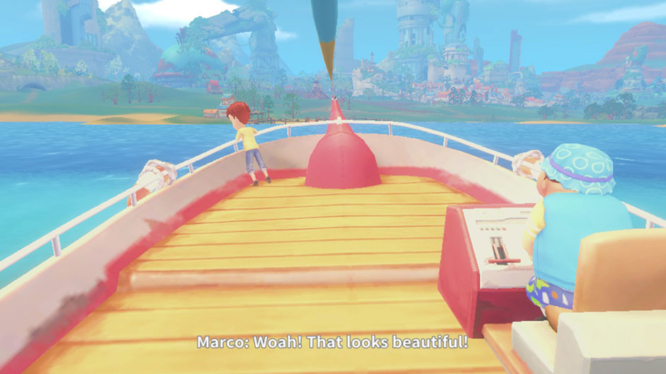 The sheer amount of content in My Time at Portia is impressive and despite lacking polish in some areas, fans of the genre are almost guaranteed to have a good time. If you've been looking for your next time sink, My Time at Portia might just fit the bill. It's a game that could very well keep you occupied for months.